On weekends as per advertised dates, Ceres Rail Company will be offering a day trip to the Elgin Railway Market. to Elgin where you will leisurely spend 3.5 hours at the newly established, Art Deco & Art Nouveau inspired, Elgin Railway Market. While enjoying live music, you can pander through the selection of tantalising food and beverage stalls as well as a wide selection of home grown wines for your enjoyment. Departing from Elgin at 14:30 you will embark on your relaxing train journey back to Cape Town with your estimated arrival time being 17h30. 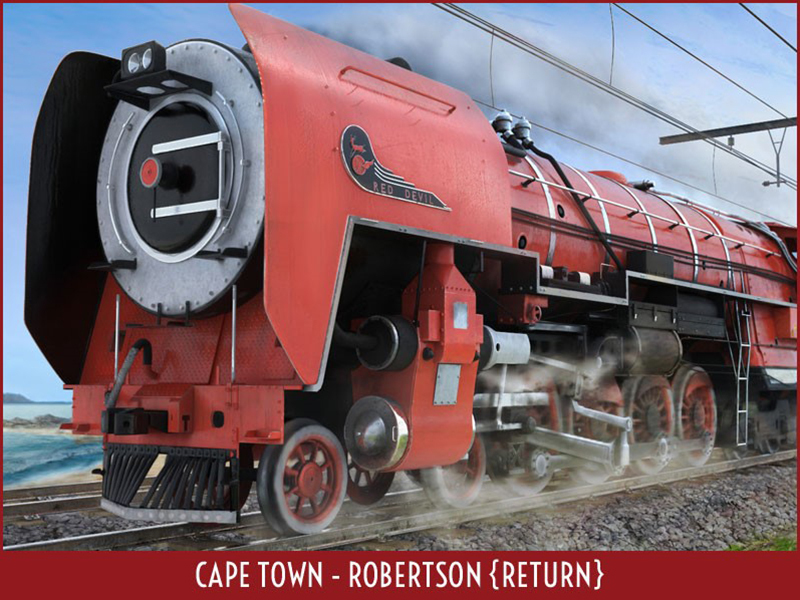 Join Ceres Rail Company for a trip on the Red Devil** from Cape Town to Robertson return with photo run past opportunities and visits to wine estates. We have split the trip into 4 booking options. Option A – Trip from Cape Town to Robertson on Friday 24 May with a return from Robertson to Cape Town on Sunday 26 May including brunch at Overhex. Option B – Day trip around Robertson on Saturday 25 May including lunch at Rooiberg and 2 wine tastings. Option C – The full 3 day trip including the return trip and the day Trip. Option D – The full 3 day trip including 2 nights’ accommodation on the train. Above trip cost: R1200 per person. Brunch at Overhex included in your ticket price. Meals (except for the brunch at Overhex), accommodation, snacks and drinks for your own account. Above trip cost: R990 per person. Lunch and wine tastings included on the day. All 3 days on the train – R2190 per person. All 3 days on the train plus 2 nights’ accommodation on the train – R3090 per person. Join Ceres Rail Company for a trip to the Wacky Wine Festival on the Red Devil** from Cape Town to Robertson return including visits to wine estates. Option A – Trip from Cape Town to Robertson on Friday 7 June with a return from Robertson to Cape Town on Sunday 9 June including brunch at Overhex. Option B – Day trip around Robertson on Saturday 8 June including lunch at Rooiberg and 2 wine tastings. © 2018 Ceres Rail Company. All rights reserved.